When is the last time saving for retirement crossed your mind? Do you have your savings on auto-pilot, or are you waiting until you’re “older” to start investing? You shouldn’t be putting off saving for retirement, especially if you’re in your 20s or 30s. If you haven’t heard by now, time is on your side, so the sooner you start, the better. That’s because the power of compound interest isn’t something to shrug off. Even if you have your retirement contributions set to come out of your paycheck automatically, it’s still worth it to consider whether or not you’re in a position to increase those contributions. You should always be looking to get the most out of your retirement fund. 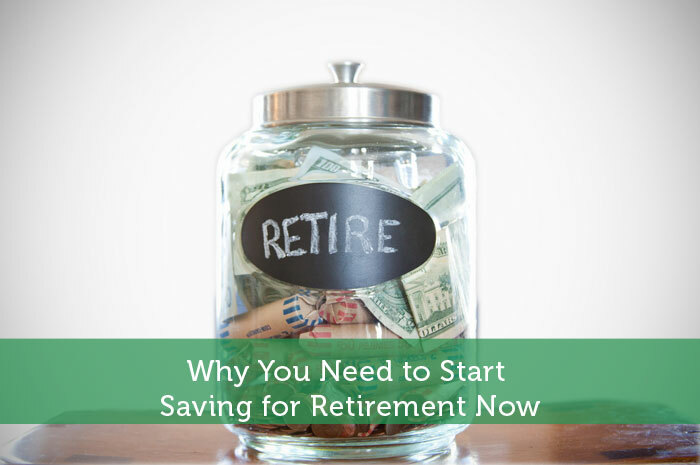 We’re going to review why you need to consider saving for retirement now versus putting it off until later. Compound interest is probably the biggest factor in why you need to save for retirement early rather than later. You start off with $1,000 invested in a retirement fund. You contribute $200/month toward that retirement fund for 10 years. After those 10 years have passed, you’ll have $39,708.09 in your account, assuming an 8% return. Now, what if you could contribute even more? Instead of succumbing to major lifestyle inflation, you decide to dedicate a portion of your raises to your retirement fund (smart move!). So you double your contributions and put $400 toward your fund. Starting with that principle balance of $39,708, after another 10 years have passed, you’ll now have $160,825.13 in your account. To give you a full picture of how this can work in your favor over the years, let’s take a step back. Say you’re starting out at age 25 with a $1,000 initial investment, and you can afford a $500/month contribution. You decide you’re comfortable with that amount, so you keep it the same for 30 years, until you’re ready to retire. At the end of those 30 years (with an 8% return), you’ll have $744,137.86 in your account! How is that not worth saving for? Keep in mind that to max out your 401(k), you have to contribute $17,500 annually, which is $1,458/month. If you can boost your contributions throughout your career, you’ll be golden. Some people are hesitant to invest in their future when they’re busy living for the present. It’s difficult to strike a balance between the two. You might want to save for a house, or a wedding – not your retirement, which is years away. That’s why it’s so important to start early – you’ll naturally develop the habit of saving. If you have automatic deductions, you won’t even notice the money disappearing from your paycheck. However, if you get used to getting paid a certain amount, you might be resistant to the thought of lessening your paycheck. Learning to live on less will benefit you in the long run. You don’t even have to start big if you don’t have much wiggle room in your budget. Put away what you can afford to each month, and slowly increase it from there. What matters is you start somewhere. With the end of the year right around the corner, it makes sense to bring up the fact that by contributing to a 401(k) or traditional IRA, you’ll lower your taxable income. This is because the money you’re funding your retirement plan with is considered “pretax” dollars. That means that the money is coming out of your paycheck before it incurs any taxes. This can be great if you’re a high earner wanting to squeeze into a lower tax bracket. It can serve as extra motivation to save for retirement! It’s worth it to note that if your employer matches your contributions, you’re leaving money on the table if you don’t take advantage. To illustrate how this works, if your employer offers a 100% match on up to 6%, and you gross $70,000 annually, you need to contribute $4,200 (6% of your gross pay) to receive the $4,200 match from your employer. However, if you only contribute $2,000, then your employer will only contribute $2,000, which means you lose out on $2,200. Don’t let that happen. I’ve never been offered a retirement plan through work, and I procrastinated on opening one. I really wish I hadn’t, as I missed out on a few years of compound interest! From experience, I can tell you it’s relatively painless. Opening an account should take you all of 15 minutes, at most. If you find yourself confused or overwhelmed, most brokers have customer service to answer any questions you have. Don’t let fear hold you back on this one. This is your future we’re talking about – trading 15 minutes of your time for years of prosperity down the road is very much worth the initial time investment. If you’re younger, you need to get serious about saving for retirement. We don’t know what the future holds, but by taking control of your retirement savings today, you’ll be doing everything in your power to ensure a successful financial future. Erin M. is a staff writer at EverythingFinanceBlog.com, a blog dedicated to every topic related to personal finance. We talk about investing, saving, budgeting, and more. Follow us on Twitter, Facebook, and Pinterest. Great post. Another reason starting early in life is important is that most people don’t have a lot of expenses early on. No mortgage or kids means more money for saving. Start getting into the habit early on it will help a lot later in life. Very true, Syed! Saving earlier is definitely a lot easier without a mortgage payment or kids. Time to get serious about the retirement savings instead of just letting it sit in the bank at minimal interest rates. It’s a simple recipe that is easy to follow but people just don’t get behind it enough for some reason. If more people knew how important compound interest was, there wouldn’t be so many worried 40 something adults running around here right now. Looks like most of Americans over 30 missed the memo. Great advice for the young. Now I know, everyone who wants to retire comfortably should start at a young age. Do you have any article, about how much to invest per month to acquire a target earning asset for retirement? Thanks for this. It’s worth reading. Compound interest is so important! Great article. Such good advice. Starting to invest early is one of the best ways to set yourself up for financial success. It’s just hard to catch up with a 401K if you don’t start contributing until later in life. There is no substitute for starting early. My investment focus is on rental properties, but the same advice applies. I think the key is to follow the light that you have. We all have to admit saving is more difficult than it looks. It’s so easy to spend the money today or this year, while only thinking on retirement is simply unacceptable. Those who manage to think a step further, or more, are the only ones to start saving and saving to the end, for the sake of their lives at that age. Excellent advice. I find it amazing to see how much money you can have for retirement, just because you are consistent in your saving efforts. Always a good idea to put aside anything, even if you can only spare 1% of your income at a given time in your life … it’s insurance against an old age where you can’t work for yourself! Agree! I wish that a lot of new graduates can stumble upon this article so they can begin saving for their retirement. I couldn’t agree more! We need to settle our own retirement savings now. I mean at this very moment. Time is really precious. We need to love Math because it’s really fun! It is so important to start saving for retirement today. Even if you’re already 60, today is so much more important than tomorrow! I take the approach to save first and spend second. This helps to ensure I save for retirement each month. At first, I started small so I didn’t notice the amount missing from my pay, but over time, I’ve steadily increased the amount I’ve saved because I’ve learned the power of compound investing. The earlier you start, the bigger the effect of the compounding (and longer period to ride out volatility). It’s hard when you’re young to accept the idea of delayed gratification, but once you’ve accepted it’ benefits, you’ll be thanking your younger self all through retirement!